On the part of the government LGRD minister Abdul Mannan Bhuiyan rejected the allegation made by Hasina and Jalil. He argued that the government could not do anything that might upset the stability of the country. "They have blamed the government out of emotion", he added and advised the AL to refrain from such baseless accusations, which would hamper the investigation process. Accusing the political opponent for anything bad has been a long established culture among our politicians. On the first couple of days after the deadliest ever grenade attack on August 21 many hoped to see an end to that tradition when people cutting across all political camps, beliefs and ideologies condemned the heinous crime in unison. The almost unanimous reaction was that this attack was not just against a group of individuals but an attack on the sovereignty, democracy and secular values of the country. They all demanded quick arrest of "the enemy of the country". The government, apparently shocked, vowed to hunt down the perpetrators of such a gruesome crime. But soon the notes of discord could be heard. In an interview with the BBC within a couple of hours, Hasina said the attack was made with the encouragement of the government. On the part of the government LGRD minister Abdul Mannan Bhuiyan rejected the allegation made by Hasina and Jalil. He argued that the government could not do anything that might upset the stability of the country. "They have blamed the government out of emotion", he added and advised the AL to refrain from such baseless accusations, which would hamper the investigation process. That is of course the last thing on AL's mind and it has continued to blame the BNP for the attack. It however widened its list of accused by including "the fundamentalist forces" (clearly indicating Jamaat-e-Islami) along with the BNP. They demanded, moreover, the resignation of the government. In response to AL's allegation, the BNP preferred to take the defensive stand, at least for the time being by proclaiming its innocence. But very soon the attacking tone asserted itself when they accused AL of attacking their own rally. They of course had their own arguments to make such a claim. AL, they said, had done it to destabilise the country and discredit the government only to grab the power. So that they do not look as if going to power was their only or main target. AL, on the other hand, has explained why they were asking the government to quit. Reasons the AL cited include the formation of a judicial investigation commission, which it said was a cover up, as investigation under Justice Joynul Abedin could not be neutral for he had been actively involved in the BNP politics in the past. Other points of contention include the delay in launching the investigation, letting the spot of occurrence go unprotected that allowed very crucial evidence to go missing and keeping the truck used as podium in police custody. And since then the AL and BNP have got locked in the same old practice of accusation and counter accusation, each attacking the opponent with greater gusto and coming up with new allegations every day. In the process, both the parties are circulating somewhat far-fetched theories. The quarrel between the two parties has been taken up by a large contingent of pro-BNP and pro-AL intellectuals. The casualty of this perpetual feud is of course an impartial investigation. 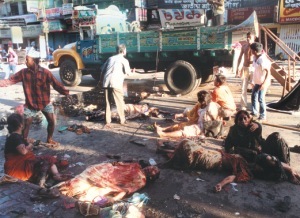 The initial shock subsided within a few days of the bloodiest grenade attack and the bitterness and enmity between the two parties only intensified. PM Khaleda Zia however made an attempt to make up by asking to meet with Sheikh Hasina and later wanted to write a letter. But the AL refused to bend. Thousands of AL activists and supporters kept a day-long vigil at various points in Dhanmandi to prevent Khaleda Zia from getting to Shudha Sadan, Hasina's residence. AL accused the present government of never taking the issue of Hasina's security seriously. AL at the fag end of its term in office made a law for the security of Bangabandhu's last two family members --Sheikh Hasina and her younger sister Sheikh Rehana. After BNP came to power in 2001 it scrapped the law ignoring AL's plea. 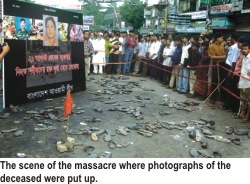 Throughout the last 3 years of BNP's rule there have been 4 attacks on Hasina in different parts of the country. Recently Hasina received a death threat over telephone when she was in Turkey to attend the D-8 conference. 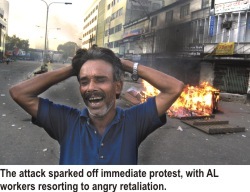 But when the AL deputies raised the issue in the Parliament PM Khaleda Zia scoffed at the seriousness of the threat. All this has convinced the AL that the BNP isn't serious about Hasina's safety and Khaleda's proposed visit was only for show. The attack has certainly sparked much heat in the political scene. The AL has been lobbying with leftist parties as well as Jatiya Party (Ershad), JSD (Jatya Shamajtantrik Dal) and Workers Party to forge a broad-based opposition alliance and launch a movement to oust the BNP government. BNP in response to the demand of its resignation is accusing the AL of exploiting the August 21 attack to get to power. Hard-liners of the BNP are saying that the attack was propelled by AL, referring to the fact that none of the grenades landed on the truck where Hasina along with the entire front line AL leaders were standing. They also argued that even when there had been a number of terrible bomb attacks during the AL regime the party did not step down. In the last seven years we have witnessed a series of bomb blasts -- Udichi, Ramna, Mymensingh cinema halls, Narayanganj AL office, the Shahajalal shrine in Sylhet and Paltan Maidan. Some political leaders discovered a pattern in the attacks: in most cases secular forces and those who believe in culture, tradition and democratic values are the target of the attacks. Some suspect a plot by international Muslim extremist groups; some are hinting the association of ISI (Inter Services Intelligence); while Jamaat leader Matiur Rahman Nizami believes it is the "well known enemies of Islam" who are masterminding, through various organisations, to carry out such brutal murders. While such speculations can go on indefinitely, the perpetrators of the crimes remain unmasked and the threat to security, to democracy and secular thinking, remains. The fact that both the AL and BNP governments have failed to pursue any of the bomb cases can mean one of two things: either they are insincere or else they are incapable of making any serious headway into the crimes. Some political analysts have observed that had Khaleda been able to visit Hasina it could very well have been the beginning of a novel political tradition. Provided, of course, that both the government and the opposition created an environment of co-operation and tolerance, which are non-existent in our political culture. "I believe some extremist group, which has professional hands under their command, is behind the attack," says Maj Gen Syed Md Ibrahim, a well-known security analyst. "The fact that the grenades didn't hit the truck doesn't necessarily mean the attackers are unprofessional. May be the truck wasn't their target and if you have to make sure that not a single grenade would hit the truck even then you need professional hands," he argues. So will the case be solved? Maj Gen Syed Ibrahim says it depends more on political will than anything else. "I am hopeful the case will be resolved, if, there is an understanding among the political parties that all of them will sincerely assist the investigation process," he says. It's a big if, though. Much responsibility rests on the government's shoulder as they control the investigating agencies. But does our police department have the skill and expertise to handle such a case? "Well, that is the reason why the Interpol and FBI are here. Besides, it is not the lack of talent but the lack of environment that possibly restricts the police to perform their level best," he says. Ibrahim puts great emphasis on the cooperation of different political parties to unearth the grenade attack incident. He wants to give Khaleda credit for her intended visit to Hasina's house. "In fact Khaleda Zia should have met Hasina much earlier than she attempted without waiting for protocol and affirmative response from Hasina. 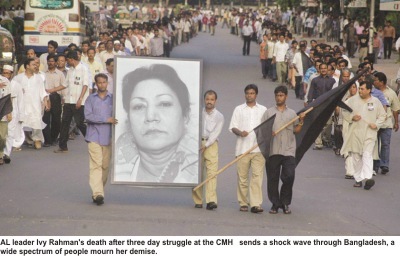 And Hasina should also have allowed Khaleda in. Things could change in a big way for the better, of course," he concludes. 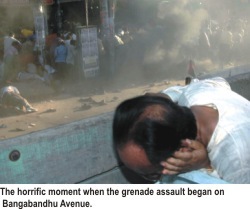 In the absence of information on the Augusts 21 grenade attack on an Awami League meeting, speculations have run rampant. Not only are ordinary citizens letting their imagination run wild with various conspiracy theories, the government as well as the opposition are adding fuel to the fire by accusing each other of having a hand in the attack. The constant mudslinging and finger pointing by the ruling coalition and leaders of the opposition have only lead to the further muddying of the real issues. The post-attack state of affairs is also marked by a glut of theories put forward by various columnists. Sifting through the spreads run by local dailies is another head-churning journey. Many of the columns are riddled with assumptions. The chasm in the national polity surfaces in the printed words as well. The pro-AL pundits as usual have done their bit by lambasting the coalition and laying the blame straight at the door of the fundamentalists. Meanwhile the pro-BNP theorists somehow managed to point fingers to the AL while its link to the country's biggest neighbour remains a recurring motif in the dailies that steep considerably to the right. Moshiul Alam, a journalist and one of the Deputy Editors of the Daily Prothom Alo, is constantly being badgered by two of his friends to oblige them with information on who carried out the heinous attack on AL meeting. "Being a journalist, I too, am in the dark. The government seems to be harbouring the same colonial tendency to hide information," exclaims Alam. "Every time we ask the relevant agencies to update us on the August 21 investigation, we are told that for the sake of the ongoing investigation they cannot leak any information," Alam adds. His friends are members of the two archenemies that make up the bi-polar political matrix, namely BNP and AL. Both of his friends are being short-changed by the parties they belong to as well as the state they live in with regards to objective information. After the August 21 attack, the Criminal Investigation Department (CID) was, as a matter of course, in charge of the investigation. Then came the Interpol to lend a hand and Federal Bureau of Investigation (FBI) followed. According to newspaper reports, the FBI arrived on their own without any official invitation, flouting national security policies. Interpol arrived in accordance with the government's wish. They sent two of their experts, Jeffry Eyles, an expert on public safety and terrorism affairs and Jecqueline Pullums, a US analyst of civilian terrorism on August 29. Two other interpol experts -- American Marash Vucilaj, a specialist on public safety, and Chinese Xin Hu, an expert on terrorism flew in on Sept 1 to join his colleagues. Pullums left the country on SEP 3 with video footage and photos. 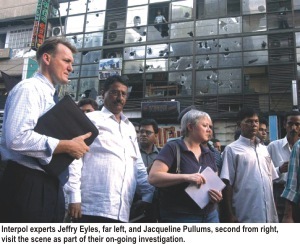 Interpol has come to assist the ongoing investigation, their job is to help the Bangladeshi agencies gather evidence. However, in the end, it was Interpol who was calling the shots. By September 6, they were through scanning the video footage and a list of 14 suspects. Then began the hunt for a seasoned criminal named Mukul, whose presence at the AL rally has raised a lot of questions. However, RAB (Rapid Action Battalion) operations in seven areas in the city on September 6 resulted in the rounding up of 6 men connected to other criminal activities. None from the list of 14 were arrested. The next step for the Interpol was to record the mobile phones of the AL leaders who were present on the spot the day of the attack. It was at this point newspaper reports revealed that Interpol was giving directions to six intelligence agencies in Bangladesh. Gibson Wilson arrived on September 1. The forensic expert and special agent of the FBI, an intelligence outfit of the US government, appeared in the rather muddy scene. Interestingly, the CID, Bangladesh government's intelligent unit, had no inkling of his arrival. 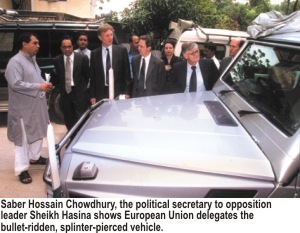 Wilson went to inspect the bullet-ridden Mercedes sports utility car of the former Prime Minister and the leader of the opposition Sheikh Hasina. The CID officials came down to Shudha Sadan, opposition leader's residence at Dhanmondi, to have themselves introduced to the foreign expert. Regarding Gibson's arrival, the only clear answer came from the Minister for Industry and the emir of Jamaat-e-Islami, Matiur Rahman Nizami, the chief of one of the major stakeholders in the coalition government. In a press conference of his party, he confirmed that the FBI expert came with prior knowledge of the government. 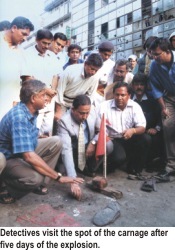 In the face of the series of bomb attacks, it was the Information Minister who said that Bangladesh would not seek assistance of any international organisation other than Interpol. While India as well as the US stood ready to offer help, the minister set aside any possibility for bilateral assistance by saying, "an Interpol investigation covers probe assistance from 181 of its member country." 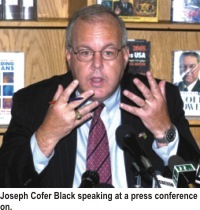 However, the news of arrival of Joseph Cofer Black, the Senate Department coordinator on anti terrorism helped clear the ambiguity that followed the arrival of the FBI agent. Bangladesh had already signed many treaties with the US and is now on its way to sign another major protocol. Although many experts revealed their surprise about Black's visit, the stage was already set for his arrival. In the media his visit was seen as a follow-up of US Assistant Secretary of State Christina Rocca's visit in May, when she stated, "Bangladesh is going off its tolerant track record", and Congressman Joseph Crowley's in January who said, " Intolerance is taking hold of some parts of Bangladesh." Black was here to pave the way to the signing of the Terrorist Interdiction Program (TIP) and a memorandum of intent (MoI) signed between Washington and Dhaka during Rocca's visit. While Foreign Minister nullified AL's plea for having a UN or Commonwealth-run probe, as "unrealistic and impractical", the US Ambassador in Dhaka Harry K Thomas' enthusiastic offer to lend a hand prefigured the arrival of US assistance. In a meeting with the Rural Development and and Co-operative Minister Abdul Mannan Bhuiyan he expressed the US' readiness to send experts. Bhuiyan, also the secretary general of the BNP, met the envoy at his Secretariet office and said on August 31, "If the Interpol suggests that we should seek further assistance from any other body, we will act on that and in that case we may seek US assistance as well." Black, who has had a long stint with the Central Intelligence Agency (CIA) and is responsible for US efforts to improve counter-terrorism co-operation with foreign governments, arrived on Sepember 5. On the second day, before leaving for Nepal, he attended a press conference, where he and the Foreign Minister M Morshed Khan hinted at the signing of counter-terror protocol in the future. While Khan said that Bangladesh would consider any offer from the US concerning the fight against terrorism, Black left a whole contingent of newsmen wondering about US's stand on India's claim that there are "terrorists camps" in Bangladesh. All questions concerning India's claim remained unanswered. However, Black assured that intelligent agencies of Bangladesh would receive both training and equipment from the US after the signing of the said protocol. It is common knowledge that the law enforcing agencies in Bangladesh lacks expertise in forensic as well as in anti-terrorism. The Chief of police himself has admitted to their limitations in investigating cases of bomb blasts. 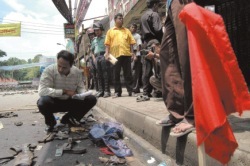 He said that the Bangladesh police is deficient in expertise in identifying and defusing explosives and that they are yet to develop ballistic and forensic experts. Intervention by international experts was inevitable. However, that too does not promise much. In fact, experts believe that the involvement of the FBI fails to trigger hope as they have utterly failed to secure their own homeland in the pre-9/11 regime. Brig Gen (Retd) M Sakhawat Hussain national, security analyst, believes that either the government lacks such expertise or the agencies have diverted their attention to other matters. 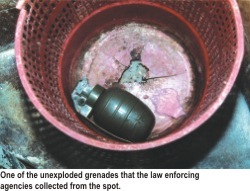 About developing explosive defusing know how, Hussain says, "The Bangladesh army has been giving training in detecting and defusing bombs for the last three decades. They have been working on explosives in Kuwait. In fact it is our experts who are certifying other outfits to engage in IED (Improvised Explosive Demolition) in Kuwait." 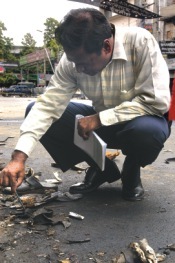 Hossain questions the very decision to send law enforcing officials abroad to receive training on explosives at this stage; he considers it to be too late an awakening. He also adds, "The way Interpol is looking at things from myriad perspectives is something beyond the means of our intelligent agencies." As for the investigation into the series of bomb to examine the bullet-proof vehicle of the opposition leader that took seven bullets during August 21 attack. He collected evidence and then sent it to the US for laboratory tests. Inspector General of police (IPG) Shahidul Haque told The Daily Star on September 4, "I don't have any knowledge of whether the FBI agent left the country or not." The Interpol officers have been engaged in scrutinising police and media records on the suspects. Before venturing into all this, after six days into the investigation, local investigators quoted the Interpol team as saying that "bombs were hurled from both above and the ground." As for the judicial enquiry commission, the one-man probe body manned by justice Md Joynul Abedin started its work, collecting eyewitness accounts. By September 2, the last day for enlistment, the commission recorded 17 people as witness to the blasts. These witnesses were asked to come forward to its office at 2/A Circuit House Road, Kakrail to record their statements. Equating global terrorism with the series of bomb blasts in Bangladesh has a detrimental side to it. According to Farhad Mazhar it is a pretext for the US to find its way into Bangladesh, which is a strategically important country in the political map. "In the present geo-political context and with the growing friendship of China with Myanmar and its move to build a sea-port in Coco island for the Myanmar navy, the US as well as India have much to worry about," says Sakhawat Hussain. He also believes that fighting terrorism in Bangladesh is linked with the war against global terrorism. Hussain firmly believes, "It has outside connections." Hussain also stresses, "By now we could also have a civil intelligence cell to collect data and to do research on the series of bombing. Since we have already aligned ourselves with countries that waged the war against terrorism, we could have developed some expertise on that line." But, at the home front, no such luck awaits us. Even a cursory look at our intelligence outfits bound to raise an alarm. All three agencies are ailed by problems regarding logistics as well as inadequate work force. The Central Intelligence Department CID comprising 500 staff members, has about 150 positions vacant. Apart from lacking in technology, they also have to deal with nitty gritties like not having enough vehicles or even phone lines. An official said to a reporter that the department has about 50 investigators, but they often do not get the required vehicle during investigation. "We sometimes go to spots to investigate without the necessary back up, which is risky," he adds. CID is a neglected department. Even the position of the department chief, generally an additional inspector general, remains vacant to this days. Both the Detective and Special Branch are facing similar problems. Of the 2268 positions of the Special Branch (SB), 1000 are vacant. The DB is the agency that is supposed to warn the other agencies of any bomb attack but they utterly failed in doing so. Now, in the face of repeated failure to solve past bomb blasts cases and the ongoing investigation on August 21, the chief of Special Branch has said that the authorities concerned are thinking of developing the detective agencies as specialised force. At last the authorities are thinking of modern forensic installation, video recording teams and modern telecommunication systems. Will this lead to a complete overhaul of the intelligence agencies in Bangladesh? Will this confirm that these agencies would be allowed to pursue the cases without intervention from the high-ups? These are the questions that overshadow the future of all investigations including the grenade attack on the AL rally on August 21.